I wathed the whole race on replay today morning with clear head, you should too. 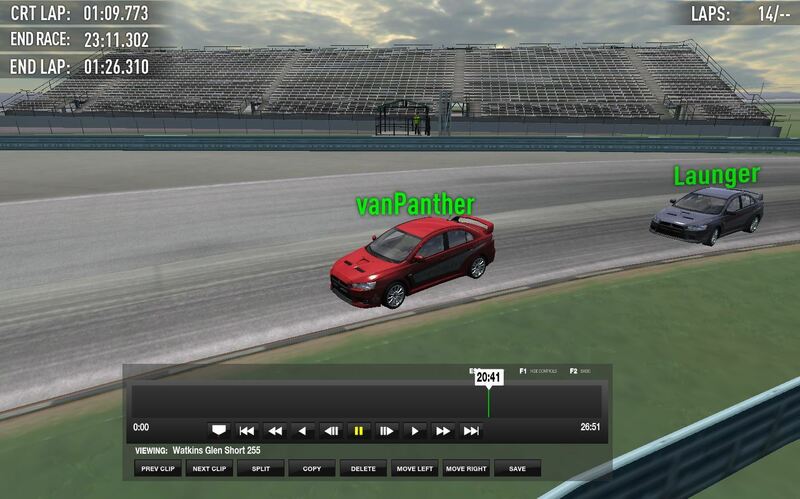 Yes i know how i was faster on chicane: beause i braked later and took it better. How do you think you can cut the chicane if at entry there is armco right after the curb? 2 wheels will be behind white lines always, unless i dematerialize and go throuh armco. In the past when i look back the greatest fights and best races i had was with you. it was a great battle everytime between us. But when you remember, me (barichello>the slow driver without chance>not talented as you->mr.schumacher ) overtook you a lot times. but was everytime a great battle with you. very fair. just to say it. I know that on this track are some places to use cuts. in last race with shadow here, he cutted the chicane in the 1st two laps (dont know why for coss this is ok. but thats a different discussion. for him maybe again a great move like overtakes outside the track ) to get back in my draft. thats why i was looking back a lot times when i was driving yesterday. so i saw sometimes that you was going wide on T1. and i watched the replay too. and i can say that you was driving fair without using cuts. hoply this part of our discussion is now over. 3rd: as i said. i almost missed the start and was on standard fuel. my fault too. without that i would be a bit faster for sure than yesterday. so it wasnt a very good race for me yesterday. i had many thinks in my mind too and couldnt concentrate very good on track. again my fault. this thinks together and your great driving trough the chicance made me slower yesterday. because i was wondering about the splitt times and was thinking that you use a cut. sorry. last think to say. i dont feel as looser yesterday because i still think it wasnt a fair move. and true. i will not get famous like you will, mr schumacher. i am just here for fun. not to get famous. Btw, i remember hearing you use the pad on purpose with evo only because its faster this way, since the car doesnt bog with full lock and with pad you can get that lock on faster than with wheel, is that true? I've just analysed the incident between Launger (Risto) and vanPanther. It's an interesting one for all of us to have a look at. Picked lap 13, 14, 15 and 16, because every other below 13 show the same line taken by Panther. As you can see there's a clear difference between the regular laps (below 16) and the last one (16th). Panther was defending on the inside before the braking point, and Launger took the widest possible, fastest line around. Braking points are all good, so Panther braked earlier to adjust it for the tight, inside line and Launger later and much deeper into the corner, using the widest line potential. The problem starts in exit phase. Panther exits at nearly the same moment as Launger, what is not possible from this inside line. You can do it, but you will definitely run out of the track on exit. He didnt, because his car leaned on Launger's car, pushing him wide a bit. After that initial push, Launger makes a safety move to the right, taking the wide line off the track and completes an overtake. 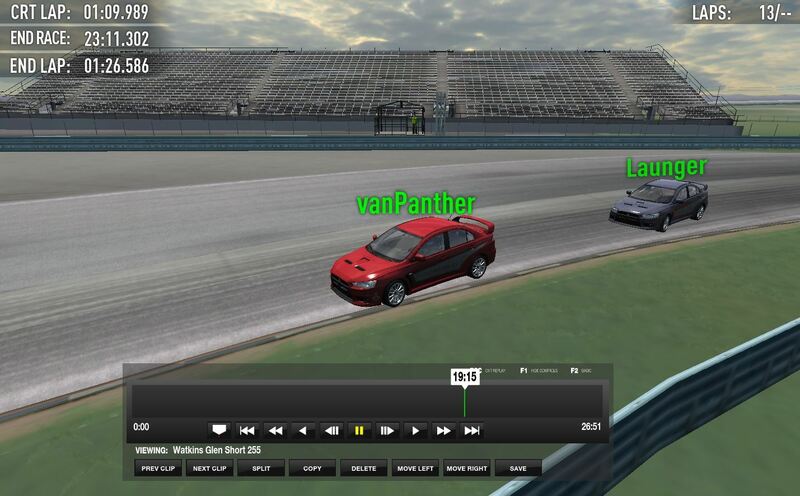 All that said, overtake was completed outside of the track and that is not legal. 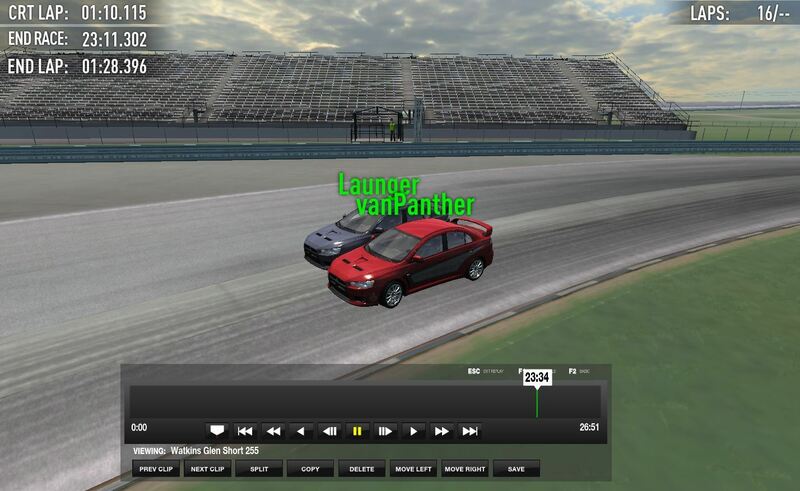 I don't want to punish you guys too much, because your achievements are well deserved, so will swap the finishing positions of Launger and vanPanther, technically reinstating vanPanther as the winner of Race 4 and Launger a runner up. true. i had a different line at the last lap. but when you look back from what line i entered this corner in last lap than you can understand why. i was coming from a different angle. i gave launger more than enough space on the outside line. that means that i was going into the corner from inside what means that you cant go trough that corner in the same way. its a close decision and hard to judge i think. but thx for changing the position. i would accept the race result too. launger did a good job following me and tryed everythink on last corners. i understand that. i would do the same on his side. @coss: i dont understand why you give me the win when the whole situation was my wrong from your oppinion to be honest. But why in heat 1 no restart, and heat 2, two restarts? 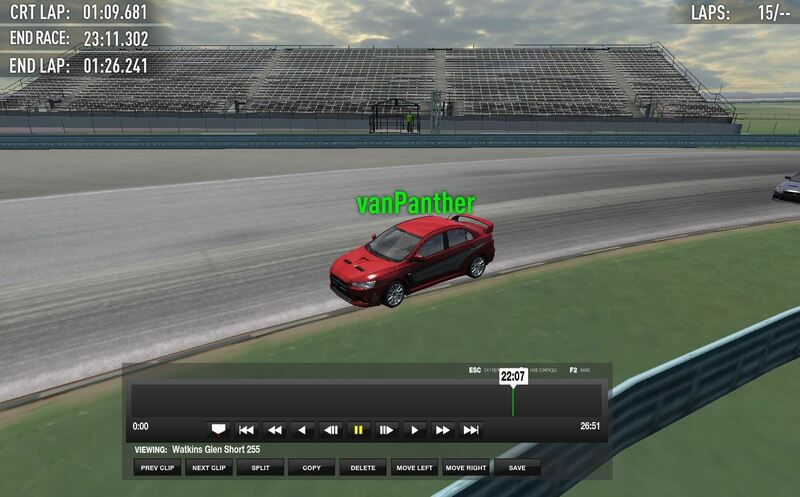 CrasHMF, there were two reasons: 1. devilbevin goes wide to the left on the uphill Turn, catches grass and starts spinning out to the right, collecting the whole field of cars (his position was P4, so very high with a large field of 10+ cars behind). 2. SuzukiLJ50 misses braking point and dives into Turn 1 from the back, taking Lukesky from P2 out. Yes, I'm Agree with you Coss, red flag must be used carefully but why in race 2 was used two times in a row? And... 8 cars crashed at the second corner of first lap for me is assolutely a situation for a red flag, in my opinion.
. We start in 14 ...less 8 cars after the first corner is too much. The race was distorted. I haven't the replay of these two restart so I can't see what is happened behind me but I don't think that it was worst of a crash with 8 cars involved...or I'm wrong? In Heat Race 1, as u saw, I did all the possible to avoid the crash but there was other cars that try to dodge the crash, someone never touched the brakes. Not only me but some racers are unfairly preclused from race just after the start. Now, the possibilities were a restart with a warning to the responsables or to continue the race and a hard sanction or a DQ for who caused the crashes. The responsables (devilbevin is one of them) qualify for the race... it isn't normal. Don't you think so? He almost put me out in heat race two, how many wrongs are allowed to someone? By doing a restart, I give a second chance to guys who screwed up, but at the same time ruin the plan for guys who got it all right there. So to me, restarts can only be used in critical moments. This is the point. There was a very critical situation in heat race 1 I think worst of race two...there was more of 8 cars involved behind me? and the successive two restart penalized me and who (like me) make all fair and clean. We can call it unluck but I think that is not only a question of luck in this case there are various responsabilities. I think that who wrong had to pay the conseguences, not who race fair and clean. I repeat, I really hope that this kind of conversation could be useful for the future choises. Sincerely I'm very very disappointed for what happened yesterday and think that something should change in the future. Now let us focus on the future .... when the new league starts? I will announce everything on Wednesday Still a lot to prepare, but I hope you guys will like it. Just testing a new Kart, which brings a lot of improvements and one revolutionary! sorry dont understand what you wanna tell me with that post.